On the other hand, I also saw a talk in Baltimore in which the presenter was very serious – and I mean very serious – and spent a significant amount of time chastising other historians for not adequately addressing the suffering of the many people who died due to a certain catastrophic event. The speaker didn’t seem to realize that he was speaking to a friendly audience – I mean, historians of medicine are more than happy to talk about death and destruction, and to assign blame for said death and destruction – and he came off as both insufferable and self-righteous. That was a decidedly unfunny talk, and I can’t say that I left it any more pleased than I left the talk about medical experimentation. One was too funny, or perhaps funny in the wrong way, while the other was decidedly not funny enough, or at least not enjoyable enough. In both cases I probably would have preferred to be somewhere else. Now, I don’t want to come off as a scold, and I should be clear that both of these talks were, in many ways, excellent – the scholarship behind them both was impressive, and the presentations were polished and compelling. My discomfort with them probably says as much about my own fussiness as it does about the talks themselves, yet I think the point remains. The content of what we say about the past matters a great deal, of course, but so does the rhetorical style in which we say it. 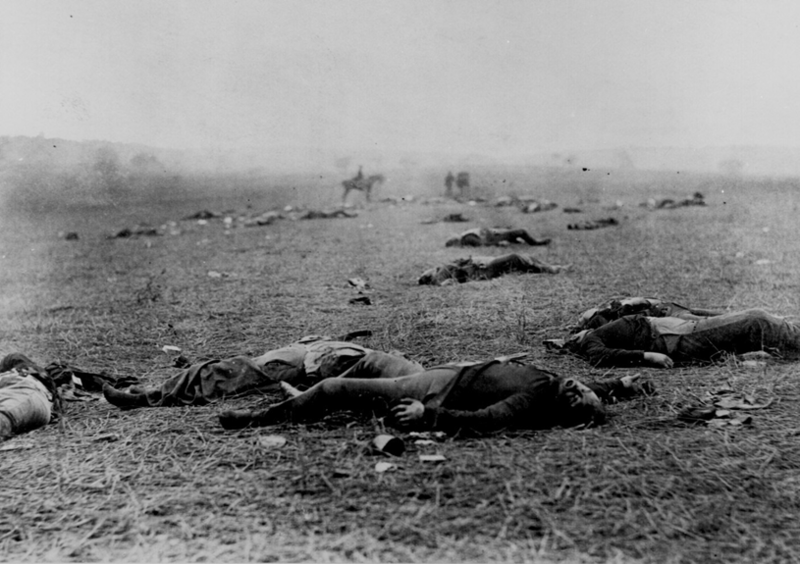 It seems to me that historians are very good at describing past events, and we are pretty good at explaining why those past events took place – although, as I argued earlier, I don’t think we are very good at explaining or describing things that fall on the more mysterious side of life, such as religious experience, pleasure, aesthetic preferences, and so on. It also occurs to me that we are not particularly good at discussing how we talk about the past – we do a decent job discussing about our theoretical approaches, of course, but we generally don’t engage in overt discussion about the performative aspects of our work, and whether or not our rhetorical choices carry intellectual or ethical significance. The main exception to this, I think, is the occasional discussion about whether or not it is appropriate to “pass judgment” on the behavior of past actors. This is an important topic, and one that we need to discuss more, but there are a host of similar questions that I think are also worth talking about. Is it appropriate to laugh at the people we write about? Is it appropriate to laugh with them? Should we describe past events only in serious tones? What about past events that are decidedly unfunny, such as mass violence? What about topics that were funny, at least for some people, some of the time? Should we always “respect” the people we are talking about, and if so what does “respect” even mean? These questions are particularly apt when it comes to drug and alcohol history. Part of this is simply because people sometimes do things while intoxicated that are easy to laugh at. I once gave a talk on drug use in the antebellum period, and during the talk I made a few jokes about the experimental use of nitrous oxide. 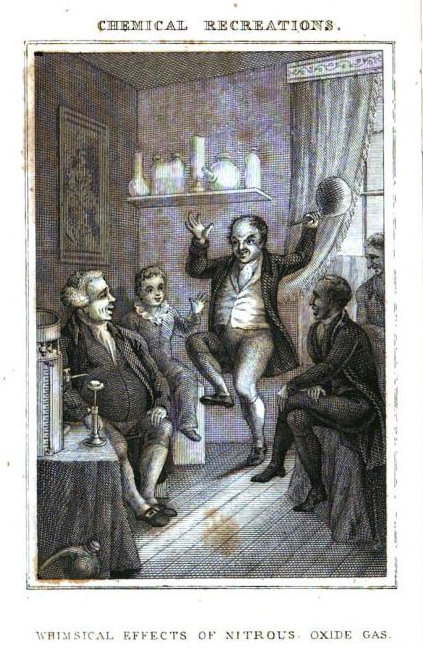 They were pretty cheap jokes, I admit – people in the 1820s inhaled an awful lot of nitrous, and they sometimes ended up doing pretty ridiculous things like running around in circles and squawking like chickens. So the jokes were easy, and my audience thought they were amusing. But afterwards, I realized that while many of the people in the texts I based my talk on laughed a lot while inhaling nitrous, they weren’t laughing at the same thing I was. They were laughing because they felt funny, and because they were running around having fun. They were laughing at themselves. But I was laughing at something different. I was laughing at them. I face other difficulties when talking about other drugs. I suppose we all do. Usually when I discuss the use of cocaine, or heroin, or morphine in public I adopt a suitably serious tone. I wouldn’t want to be seen as condoning the recreational use of those substances, after all, and even when I talk about the use of alcohol I keep it pretty serious. People have long struggled with these substances, and it only seems respectful to not to make fun of their difficulties, even if the opportnity sometimes arises. Yet when I adopt this rhetorical style I’m also conscious that I’m not really representing my subjects comletely fairly, or at least I’m not representing the full spectrum of their experiences with these drugs. Obviously, not all drug use is pleasant – but it’s not all terror and horror, either, and historians of addiction (myself included) generally don’t talk about the pleasures, amusement, and even silliness that is sometimes a part of using these substances. We are all much too serious for that. The Coffee Habit is Hilarious! …Right? I’m actuallly most comfortable mixing it up when discussing coffee – its easy to make fun of coffee drinkers, and since I drink a lot of the stuff myself I can pretend we are all one big group of like-minded souls, and poke fun at my subjects – and my audience – by poking fun at myself. Nobody ever takes offense, or raises an eyebrow, because few people take a moralistic approach to the use of coffee and few people really feel bad about their own habit. Who doesn’t drink too much coffee? Still, sometimes I wonder. 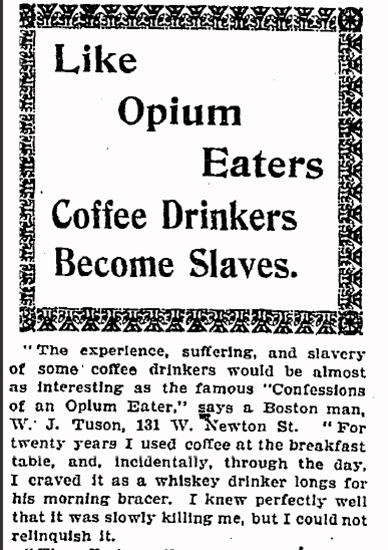 From what I can tell, at least some people were seriously worried about their coffee habits in the late nineteenth-century. I’m not sure they would have appreciated my jokes. So, anyway, that’s what I learned in Baltimore. If anyone has any ideas about these types of issues, I’d love to hear them. Although not the most pressing issue in the world, it does seem to me that this is something worth talking about. Perhaps its because I actually do think there is some sort of communication going on between those of us who write about the past and those whom we write about. The longer I’m in this business the more I feel that I’m not just documenting the past but, in some way, actually engaged in a conversation with it. And, if we are not just talking about the dead but with the dead, it seems to me that we should at least learn to be polite. Now, where the heck did those cookies go?